Joan Fowle Miles, of Fleming Island, completed her earthly journey on March 5, 2019 at the age of 97. Joan was born on August 5, 1921 to the late Donald and Ethel Fowle in Boston, Massachusetts and grew up in the City of Woburn. She was a graduate of Mount Holyoke College Class of 1943 with a BA in English Language and Literature. She married her beloved husband, Stephen Miles, in 1945. They raised their family in Burlington, Massachusetts and later retired to Fleming Island, Florida. Joan had a passionate dedication to public service in the field of Education. 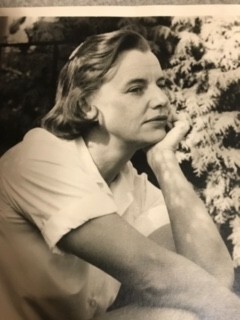 She was elected to the Burlington School Committee in 1968 and served for 6 consecutive terms. In 1976, she was honored to be named Burlington’s Outstanding Citizen and in 1986, the Burlington High School Library was renamed the Joan F. Miles Library, commemorating her 18 years of service on the School Committee. Joan had a lifelong interest in reading and creative writing. Steve and Joan collaborated on multiple projects. From 1964-1968, Joan wrote a weekly thought provoking editorial for the local newspaper, accompanied by her husband Steve’s entertaining cartoon illustration. In 1988, they spearheaded the founding of a successful scholarship foundation. They also published several books, including “Charisma”, the inspirational biography of Rev. John Muilenburg, and “Fleeting Dreams” featuring a collection of original letters exchanged by her parents during World War 1. She was predeceased by her husband of 71 years, two brothers, and one sister. She is survived by two daughters, Joanna “Jody” Miles Griffith (Larry) and Deborah “Dierdre” Miles Burger (David); eight grandchildren, Stephen Barrows (Lauren Peterson), Nicholas Griffith (Tara), Christy DeMary (Adam), Heather Katz (Josh), Jamies Griffith (Katie Brown), Eric Burger (Katherine), Joshua Burger (Elizabeth), and Sarah Canter (David); and ten great-grandchildren, Stella, Jonathan, Lily Anne, Charlotte, Lily, James, David, June, Willem, and Mason. She is also survived by a brother-in-law, Robert Miles (Nancy) and twelve nieces and nephews. A memorial service in her honor will be held at the Aaron and Burney Bivens Funeral Home, 529 Kingsley Avenue, Orange Park, Florida, (904) 264-1233, on Thursday, May 2, at 3:00 p.m.
Memorial gifts in her name will be gratefully received by the Burlington Community Scholarship Foundation, 23 Center Street, Burlington, Massachusetts 01803. There's still time to send flowers to the Memorial Service at the Aaron and Burney Bivens Funeral Home and Cremation Services at 3:00 PM on May 2, 2019.